For numbered dishes, plates etc. click here. 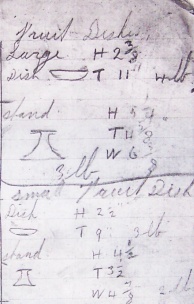 Pieces that are un-numbered but with a shape that is known to have a number, are pictured on the appropriate catalogue page alongside numbered pieces. The examples below are therefore shapes that were never in the numbering systems, or for which no numbered example has yet been recorded. Diam. 24 cm. 'PPP' (painted, not stamped) on back. 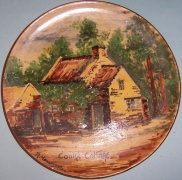 Picture labelled 'Cook's Cottage' and signed 'R.Hawkins'. 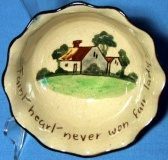 Undated but presumably produced in 1934 along with other items commemorating Melbourne's centenary year. Diam. 25 cm. 'PPP' painted (not stamped) on back. "Faint heart never won fair lady". From the Early Series period. Known only from this surviving shape-book fragment. 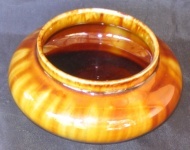 Painted underglaze. Very early, thought to date from 1933. 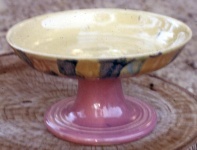 Half-round dish, diam. 21 cm.